Dateline, DQYDJ’s original research department: We decided to reprise one of our earlier data examination ideas with an even closer dive into inflation expectations than Monday’s diversion. We’ll go a bit further – since the most popular mortgage types are 30 year fixed mortgages, the actual expected cost of a mortgage isn’t the sticker price, but the sticker price minus some relative price – a sum which we will take, today, to be CPI. (And yes, relative price is the right way to look – a 6% mortgage would have been ‘cheaper’ in the 70s than a 5.5% mortgage today). Now, last time when we did this we used the 10 year inflation expectations (for which there are many more years of data). Our guess is we don’t see mortgage rates much lower than we’ve seen the last few years, so 30 years is a safer assumption – most people will either move or keep their current mortgages, not refinance. 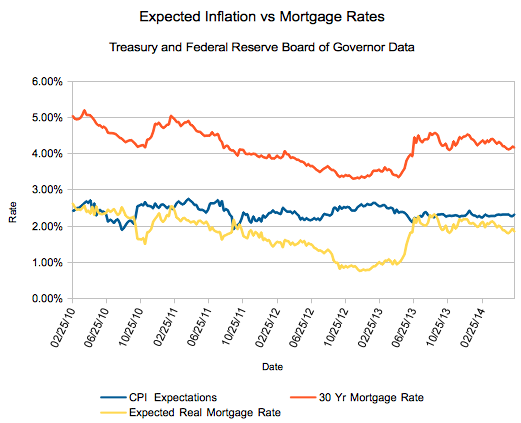 That said, note that mortgages are still under a 2% real rate. That’s not bad… if you can still find real estate bargains in your neck of the woods.